Special measures are being undertaken to prevent attacks from Russian citizens, particularly from Chechnya, who are expected to return to the country after fighting on the same side as the Syrian rebels. While the Old World is developing concern over a return to Europe of hundreds of Muslims who fought on the side of the irreconcilable opposition in Syria, Russia is also taking measures to ward off the same threat. 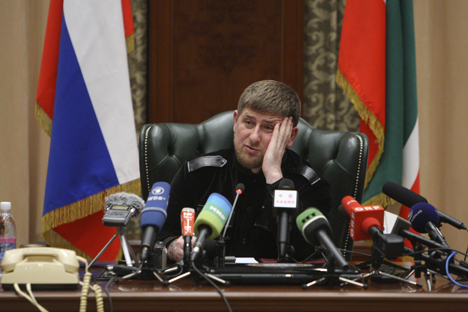 Chechnya’s President Ramzan Kadyrov has said the instructors of the Interior Ministry and the Federal Security Service (FSB) have got down to training the special assignment squads for fighting the Chechen militants and other natives of Northern Caucasus who have been taking part in combat operations against the Syrian government forces. Kadyrov voiced the apprehensions at his official Internet site that these people would return to their homeland sooner or later and would rejoin the local paramilitary groupings. European secret services, too, are watching their citizens arriving from Syria. They also seek to expose the potential extremists, even though not so overtly as their Russian counterparts do. Official data suggests that no less than 1,200 citizens of European countries are warring in the ranks of radical Islamic groupings in Syria but unofficial data quoted by the media is far more disquieting. It indicates that the number of EU citizens engaged in warfare in Syria stands between 2,000 and 10,000. Journalistic investigations done in April and May in the small Belgium alone showed that some 200 or even more Belgians of Arabic origin were fighting in Syria. They had been recruited to war by Sharia for Belgium, a radical Wahhabi organization. “The blunt truth is there are more people associated with al-Qaeda and al-Qaeda associated organizations now operating in Syria then there have ever been before […],” Charles Farr, the Director of the Office for Security and Counter-Terrorism at the UK Home Office admitted in July 2013. The Canadian Security Intelligence Service /CSIS/ says the nationals of Canada are joining the opposition forces and the extremist groupings linke to Al Qaeda in Syria. Belgian TV channel RTBF said that nine leading EU countries - Belgium, Britain, Germany, France, Italy, Luxembourg, the Netherlands, Poland, and Sweden - sent a letter to the European Parliament back in spring asking it to issue permission at an earliest possible date for compiling a pan-European list of air passengers’ personal data, which would help track down the individuals visiting the zones of armed conflicts. The measure was called upon to place suspicious individuals under the security services’ watch. Britain runs a special program codenamed the Channel, with the aid of which the authorities identify and provide patronage to the people who espouse extremist views and may hence fall under the influence of radical elements. More than 500 people, many of them school-age children, have joined the program. The Dutch government has raised the level of terrorist alert to considerable saying the decision was linked to a possible return home of the holders of Dutch passports currently warring in Syria. It is quite obvious that the pooling of efforts of the security services of many countries to counteract the threat of international terrorism. The FSB said at the beginning of November it had resumed collaboration with British security experts. John Sowers, the head of MI6 said then Britain would develop cooperation with Russia. U.S. secret services, including the FBR collaborated with the Russian authorities in the investigation of April 15 explosions in Boston. On the threshold of the 22nd Winter Olympic Games in Sochi, representatives of security agencies of twenty countries held joint consultations and exercises in Sochi to ensure security and safety of athletes and guests at the Games. Veterans of the Russian secret services hail the practice of this kind. “An event of such a scale as the OIympic Games surely requires well-coordinated work on the part of security services of different countries,” Major-General Yuri Kobaladze, Rt., told Itar-Tass. “By openly saying that special assignment squads are being trained, Ramzan Kadyrov thus sent a warning to the potential terrorists to stay away from Northern Caucasus because they will encounter well-prepared soldiers and officers there,” Gen Kobaladze said. “That’s why the security services of all the nations should make concerted efforts to prevent the spread of terrorism from the territory of Syria,” Gen Kobaladze said. “Russia leadership keeps stressing the importance of cooperation in this crucial field.